First published in The Guardian, 28 November, 2012. This cartoon was amazingly topical at the time but as events fade into the distance I realise it could benefit from an explanation. The Gangnam Style video, by the South Korean singer Psy, is the most viewed in the history of Youtube. The song and its video spawned many parodies. Ai Weiwei, the Chinese artist who often gets into trouble with the Chinese government, created his own version, which was quickly blocked by Chinese government censors. The British artist Anish Kapoor then produced a version in support of Ai Weiwei. He rallied a lot of the art world to perform in it as a protest against the repression of free expression. That, in a nutshell, is what this cartoon is about. What always baffles me is where they get the stones? When I am on the dance floor my ad-lib dance moves sometimes cause consternation and occasionally I get pelted by rocks. But we’re in a nightclub. Do they stuff their pockets with gravel before they leave the house? Are there rooms in nightclubs where you can get rocks? I’ve never seen them. Anyway, at times like this, Gangnam is my go-to dance style. The familiarity of the moves reassures the crowd; their feelings of anxiety and mounting anger at my improvised technique are assuaged. Cheers soon fill my ears. Gangnam Style certainly is familiar. As I said, it is the most watched and liked video in the history of Youtube. I have watched it again just now and it has been viewed nearly 2 billion times. An amazing statistic. My blog doesn’t get even half that. In China government computers scan Chinese cyberspace constantly, hunting for words and phrases that censors have dubbed inflammatory or seditious. When they find one, the offending blog or chat can be blocked within minutes. Ai Weiwei’s Gangnam Style parody is called Grass-Mud Horse Style. which is a reference to a Chinese Internet meme that employs a pun on an obscene phrase. The grass-mud horse and several mythical companions appeared in early January 2009 on the Chinese Internet portal Baidu. The creatures’ names, as written in Chinese, are innocent enough. But much as “bear” and “bare” have different meanings in English, their spoken names were double entendres with inarguably dirty second meanings. So while “grass-mud horse” sounds like a nasty curse in Chinese, its written Chinese characters are completely different, and its meaning —taken literally — is benign. Thus the beast not only has dodged censors’ computers, but has also eluded the government’s own ban on so-called offensive behaviour. It is an effective, if juvenile, way of mocking government censorship of the Web. By mimicking the horse riding moves in the Gangnam Style video with a pair of handcuffs, Ai Weiwei is taking a swipe at government censorship. So even though Ai Weiwei’s version is pretty crappy, it is witty. There is also something appealing in watching such a seriously respected artist make a fool of himself. Unfortunately, the same cannot be said for Anish Kapoor’s take in support of Ai Weiwei. It’s like watching a street march with people carrying signs saying “War is bad”. Of course, the sentiment is worthy – “end repression, allow expression” – and perhaps the video is designed as nothing more than a show of support, but the witlessness of the result from one of our top “creative” talents really irks me. Why would anyone not involved in the art world ever watch this? Being subject to deadlines, I can appreciate that this was put together quickly and involved organising a lot of people, so perhaps not a ton of thought went into it, but still. There is also something really grating about what comes across as hero worship of Anish Kapoor in the video. Why? It is particularly inappropriate in this context. All this is doubly annoying because Anish Kapoor does make some terrific stuff. Just like Ai Weiwei’s video, the (Paul) Gauguin Style dance moves in the cartoon are explosive examples of free expression that threaten the very existence of a repressive government. In the final panel I have gone a bit further. What usually happens after a revolution is that the new orthodoxy is enforced with utterly frightening ruthlessness. It is profoundly depressing. Whether the Revolution is French or Bolsheveik or Chinese Communist this often seems to be the case. 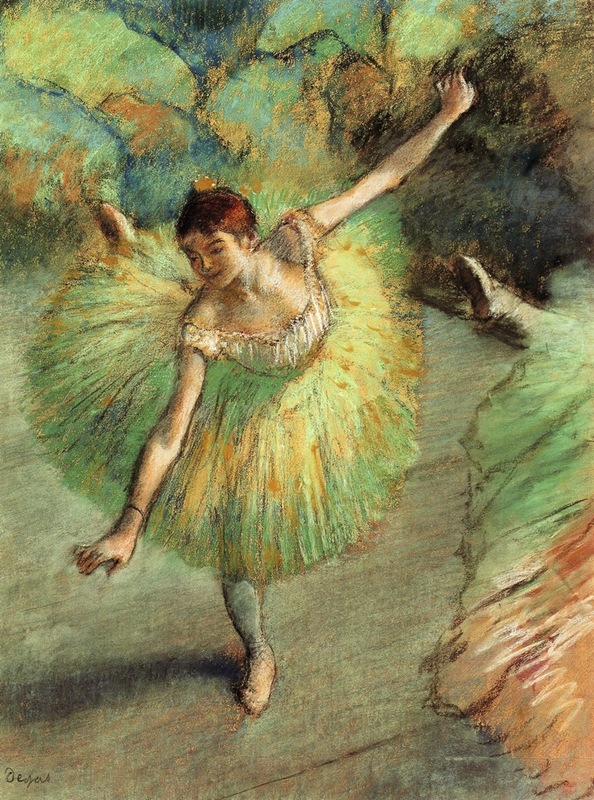 In the cartoon Degas veers out of line with some unorthodox dance moves. He is denounced. The crowd bays for blood. He will pay the price. 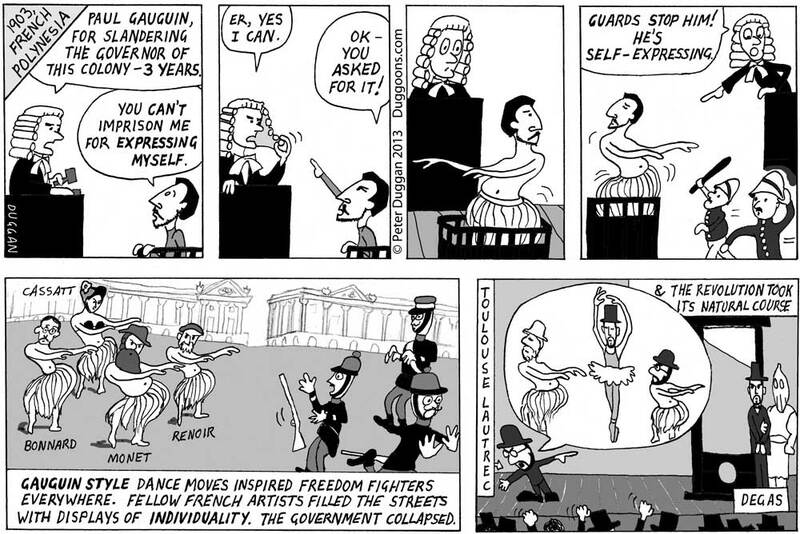 I have no idea why but Toulouse-Lautrec and Edgar Degas have developed an antagonistic relationship in my cartoons. Things will only get worse I’m afraid. (For a lot of the information on the grass mud-horse meme I am indebted to a great New York Times article by Michael Wines). Edouard Manet and Claude Monet having a chat. 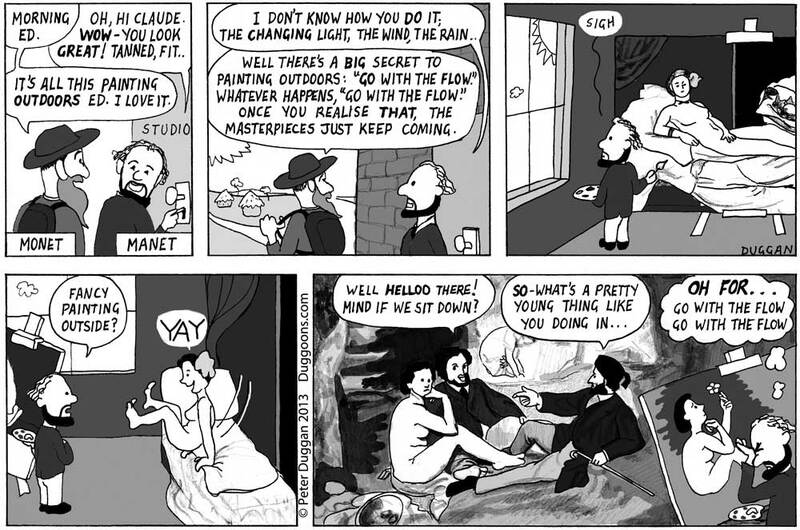 There is a nice link between the two paintings Manet is working on in the cartoon. 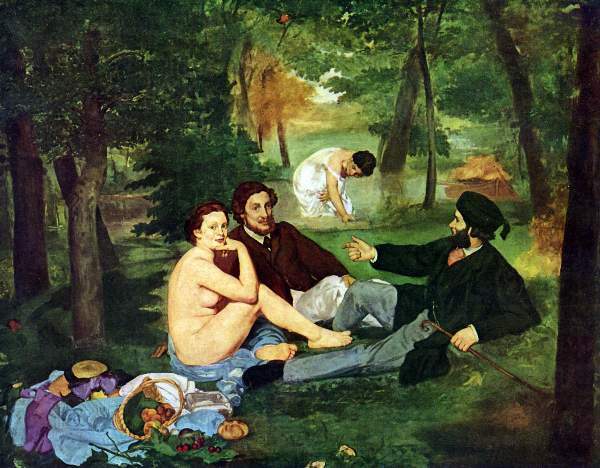 Both – Olympia and The Luncheon on the Grass – were painted in 1863 and both feature the same model, Victorine Meurent. So yes, this is what actually happened.